The right to meals and nourishment is a vital right for all human beings. Food is an essential element without which human beings cannot survive. The right to meals and nourishment is the right of each and every man, woman and child to have guaranteed access to healthy food on a daily and regular basis. • Food must be available : that is to say in a sufficient quantity for the entire population. • Food must be accessible : each person must be able to procure nourishment, either through his/her own production of it (via farming and livestock) or through his/her disbursement of sufficient financial capacity to buy nourishment. • Access to food must be stable and continuous : food must be available and accessible under all circumstances (wars, natural catastrophes. . .). • Food must be healthy : that is to say, consumable and hygienic, particularly for water. Children must be able to benefit from balanced nourishment in order to develop in a healthy manner. Nourishment and meals must be nutritionally filling and contribute to their physical and intellectual development. Balanced meals and nourishment are predicated on the correct balance between necessary proportions of nutrients, carbohydrates, proteins, lipids, minerals, vitamins, fiber and water. In this manner, one can avoid malnutrition and problems linked to either excessive eating or dietary insufficiencies. 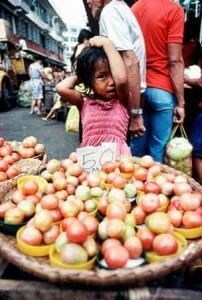 In developed countries, food security has existed for several decades. Population have never experienced difficulties with regard to the availability and accessibility of the food that they need. Problems associated with alimentary excess are thus more and more frequent and constitute a threat to the health of children and adults. This excess can lead to problems of obesity, diabetes, etc. 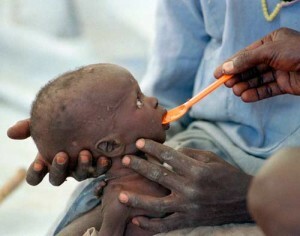 On the other hand, in developing countries, many children suffer from malnutrition. In effect, families do not possess the means or resources to alleviate their hunger and vary their meals. As a result, the children do not benefit from nutritional elements that are essential to their development and are consequently exposed to serious health problems.